1-2X10 Sungrabber Solar Replacement Panel for Swimming Pools. 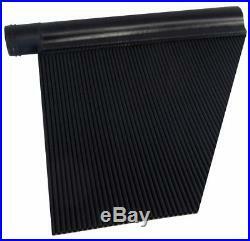 Original fafco sungrabber panel so it will easily fit into your existing sungrabber solar heating system. 1- 2 ft x10 ft Sungrabber Replacement Solar Panels. Sungrabber has a product specifically designed to meet your solar pool heating needs. Sungrabber’s solar pool heaters feature premium quality, superior technology, highest rated performance and second-to-none reliability. It simply works – and keeps on working so you can enjoy evening swims from early spring through late fall in luxurious warm water. Sungrabber’s high performance solar heating systems can be installed in just 30 minutes (for on-ground systems). Solar energy refers to the use of the sun’s rays rather than electricity, oil, kerosene or natural gas to provide heat for a wide variety of uses. Sunlight strikes and heats an “absorber” surface within a “solar collector”. The water to be used flows through the absorber that has been warmed by the sun and picks up the heat from it. An analogy is often made to a garden hose that sits in the sun and then warms the initial water passing through it. For pool heating, a flat panel is used that is made up of many small tubes. The size and number of tubes as well as the material of the absorber effect how well the sun’s warmth is captured and transferred to the pool water. The smaller the tubes, the slower the water flows through them which in turn enables more heat to be transferred to the water. Likewise, if the number of tubes used is increased, more water can be exposed to the heat and therefore warmed. Benefits of Solar Pool Heating. Solar energy uses the sun’s rays to produce heat or electricity. Sungrabber’s technology uses the sun’s natural energy in a cost-effective way to warm the water in your pool. Heats your pool to a warm, comfortable temperature. Is environment-friendly energy – free from the sun. Doubles your swim season with luxuriously warm water. Dramatically reduces or eliminates pool heating costs. Adds value to your pool and to your home. Sizing your SunGrabber Solar Pool Heating System. Pool Shape & Size. Of 2′x20′ Panels. Of 2′x10′ or 2′x12′ Panels. Up to 21′ round. 24′ to 28′ round. Up to 16′ x 24′ oval. 16′ x 26′ to 18′ x 36′ oval. 20′ x 40′ oval. Up to 15′ x 30. Up to 16′ x 36. Up to 20′ x 40. For best results for SunGrabber Solar Pool Heaters follow the recommendations in our sizing chart. It is important to use this sizing chart to ensure your system will be large enough to heat your pool. A properly sized system will raise pool temperatures 10-15 degrees during the season. For areas where the swimming season can be year round, an additional panel may be needed to heat your pool during the cooler months. The item “1-2X10 Sungrabber Solar Replacement Panel for Swimming Pools” is in sale since Friday, June 17, 2016. This item is in the category “Home & Garden\Yard, Garden & Outdoor Living\Pools & Spas\Pool Equipment & Parts\Pool Heaters & Solar Panels”. The seller is “solar-discounters” and is located in NY, USA & Montreal. This item can be shipped to Canada, United States.